AAPA has been supportive of President Obama's goal of doubling U.S. exports in five years and Association leadership has met with key Administration officials to communicate the positive impact it will have on the economy. Given their importance for moving people and freight, creating jobs, advancing environmental protections and raising our standard of living, it’s often surprising that seaports and their connecting intermodal infrastructure are given only scant attention when it comes to federal infrastructure funding and transportation policy legislation. The Port of Lake Charles announced November 3 that a vessel cleaning project involving at least 1,000 new jobs will begin almost immediately at the port's Industrial Canal facilities. The venture, undertaken by the port, in conjunction with British Petroleum (BP) and Dynamic Industries, Inc. (DII), will provide a state of the art facility for the final cleaning vessels employed as part of the massive response to last summer's Deepwater Horizon oil spill. According to the port, it will have an immediate positive economic impact on the area, including hiring personnel and spending at local suppliers, service providers, restaurants, and hotels. The work entails final (Stage III) detailed cleaning of the vessel hulls, superstructures, decks, and confined spaces. The vessels will have undergone two levels of decontamination (Stage I and Stage II) prior to arrival at the Lake Charles facility. Each vessel must pass a Coast Guard inspection and received a certification as being properly clean before being allowed into the Lake Charles channel. An estimated six to eight million man-hours of work will be performed at Lake Charles before the project concludes. Operations at the site will take place 24 hours a day, seven days a week over the next three to six months. The port says the operation will adhere strictly to a waste management plan approved by the U.S. Environmental Protection Agency and the Louisiana Department of Environmental Quality. Additionally, BP and DII are upgrading the sanitary facilities at the site, making it potentially "more attractive," the port says, "for future possible projects." The Port, in conjunction with BP, the United States Coast Guard, DII, and the Lake Charles Pilots, Inc. are working together to ensure that navigation of the channel will not be impaired. Similar large-scale, professional decontamination sites for final stage cleaning of response fleet ships are also being established at the ports of Pascagoula and Port Fourchon. The Port of Indiana Burns Harbor celebrated its 40th year in a big way- by handling the largest shipment of project cargo in its history. The 134 complete turbine units were carried by 11 ships operated by Canada Steamship Lines and Flinter Shipping from various locations around the Great Lakes. The final two ships offloaded their cargo at Burns Harbor on October 21. The turbines are being stored at the port pending delivery to their final destination in Bloomington IIL). This year, the port also handled its first outgoing shipment of wind equipment - two ship loads of turbines manufactured at the Acciona Windpower plant in Iowa for export to Nova Scotia. The port opened in 1970 and handled its first ship in May of that year, bringing to fruition more than three decades of determined effort. 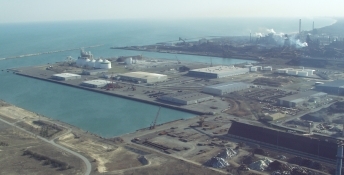 In 1939, the Indiana Board of Public Harbors and Terminals was established to negotiate for land acquisition and construction of a public port on Lake Michigan. In 1957, the Indiana General Assembly appropriated $2 million for land acquisition for a port in Porter County. 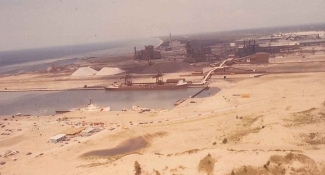 While the St. Lawrence Seaway officially opened up the Great Lakes to international ships in 1959, Indiana did not formally select a port site until 1961, and groundbreaking did not take place until October 10, 1966. Since opening in 1970, Indiana's first port has grown significantly and now contributes about $3.5 billion to the state economy. The port also generates more than 25,000 total jobs and $1.5 billion in personal income as well as $490 million in local purchases and $146 million in state and local taxes. The Maryland Port Administration (MPA) reports trade flows through the Port of Baltimore's public marine terminals are rebounding from last year's recession impacted losses. The data for the fiscal year ending June 30 show increases from FY 2008-09 of 26% for autos, 13% for pulp (which is used in the manufacture of facial tissues, paper towels, and napkins) and 2% for containers. The MPA further notes that general cargo tonnage increased by 8% from a year ago during the first six months of calendar year 2010. General cargo is defined as containers, autos, forest products, roll on/roll off cargo (farm and construction equipment), and steel. The port's cruise business continues to show remarkable progress. Cruise offerings tripled in 2009 to 81 from 27 in 2008, and passenger numbers reached an all time high of 167,000. This year, the MPA is expecting new records, with 91 homeport cruises and approximately 190,000 passengers. Next year promises to be even better, with 112 homeport cruises from Baltimore already scheduled. During CY 2009, the port's public and private terminals handled 22 million short tons of foreign trade worth $30.2 billion. MPA terminals accounted for 7.3 million tons, a drop of 18% from 2008. That included imports totaling 4.3 million tons (-23%) and exports of 3.0 million tons (-9%). Key commodities handled at the public terminals in 2009 included: pulp (+1% compared to 2008); containers (-10%); autos (-30%); Ro/Ro cargo (-38%); and paper (-48%). According to the MPA, the Port of Baltimore generates about 16,700 direct jobs and 120,000 jobs linked in some way to port activities. The port is also responsible for $3.7 billion in personal wages and salaries and nearly $400 million in state and local taxes. America's waterborne foreign trade had a good month in July. The data, as reported by the U.S. Census Bureau, show double-digit tonnage increases from a year ago for both imports and exports. Imports posted their fifth consecutive month of year-on-year growth, thanks in part to gains for crude and refined petroleum and a 145% jump in imported steel (to 2.2 million tons from 899,397 tons in July 2009). Despite the improvements, imports remained below 2008 levels. Exports continued at record levels, with monthly and year-to-date increases compared to last year and 2008. American coal exports through July were up 52% from a year ago and at their highest level since 1997. In brief, trade volumes overall are much improved from a year ago but are still short of the record volumes levels achieved earlier in the decade. Details are provided by the attachment.